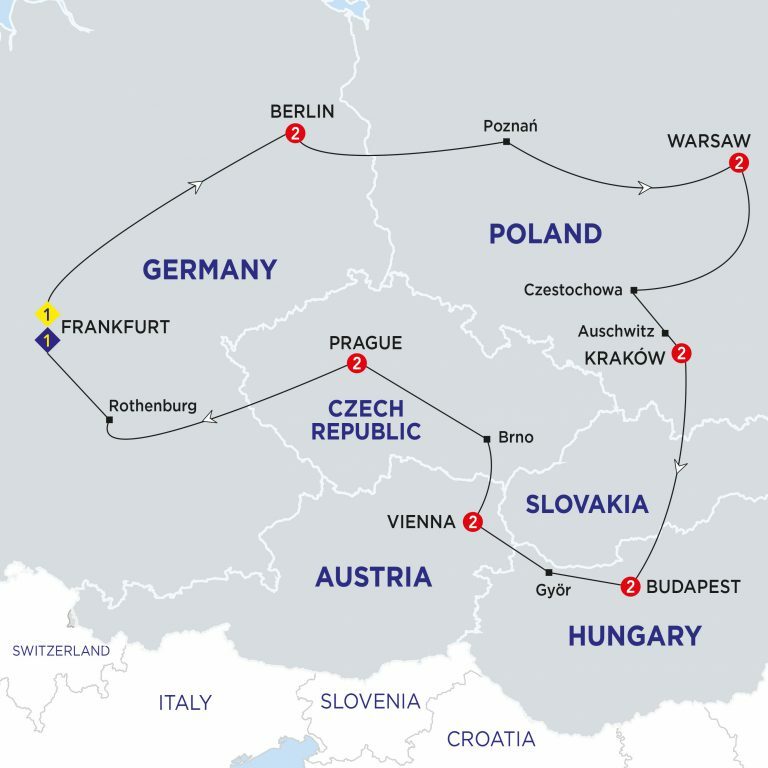 This fabulous tour takes in 5 countries and 7 cities as you journey through central Europe. Be humbled as you visit the former concentration camp in Auschwitz and see the Warsaw Ghetto. Enjoy sightseeing tours with local guides of Berlin, Budapest, Frankfurt, Krakow, Prague, Vienna and Warsaw. There are plenty of optional experiences for you to chose from to add on to your holiday giving the advantage of planning your trip around your budget. Welcome to Frankfurt. After check-in this afternoon, your Travel Director takes you on an orientation tour of the city’s dynamic financial centre and medieval Römerplatz. Cross the northern plains of Germany to the capital Berlin, a city with a rich political and cultural history. Your Local Specialist brings Berlin’s history to life during your sightseeing tour. View the Reichstag Building, Tiergarten, Brandenburg Gate, Unter den Linden Boulevard and the German State Opera House. Spend the rest of the day exploring this exuberant city on your own, or perhaps join an Optional Experience for a glimpse into Berlin’s secret past. Head east and cross the border into Poland at Frankfurt-an-der-Oder. Visit the former Polish capital of Poznan and view the City Hall, Gothic architecture and other important sights. Arrive later in the capital Warsaw, where you dine tonight at your hotel. Warsaw is an energetic and lively city and your Local Specialist reveals the city’s diverse history during your sightseeing tour this morning. View St. John’s Cathedral and the Royal Palace in the Old Town, which was rebuilt after the war. See the site of the Warsaw Ghetto. Afterwards you are free to explore and don’t miss the opportunity to take an Optional Experience to Wilanow Palace, the residence of Polish King Jan Sobieski. This evening you might like to experience a recital of Chopin’s works in the city of his childhood. Travel south to Czestochowa and view the Paulite Monastery at Jasna Góra. Dating back to the 14th century, this place of pilgrimage is home to a famous icon of the Black Madonna. Then stop to visit the poignant former concentration camp at Auschwitz, a permanent reminder of the horrors perpetrated during the holocaust. Later arrive into Kraków for a two night stay. Admire Krakow’s beautiful sights with your Local Specialist this morning including the city’s medieval walls and buildings, and the castle and cathedral on Wawel Hill. In your free time soak up the atmosphere in the Old Town or perhaps visit Wieliczka Salt Mines. Tonight, you’ll have a chance to enjoy the typical Polka music and traditional dance of Poland’s rich culture, while savoring a delicious meal of Polish specialties and beverages at our specially-selected venue. Visit this amazing UNESCO World Heritage-listed site just outside Krakow and marvel at the unique sculptures and setting of this 800-year old salt mine. See chambers, chapels and even salt chandeliers as we follow our guide 135 m (440 ft) underground. Relax and enjoy the splendid scenery as you drive through the foothills of the Tatra Mountains into the Slovak Republic and on to Hungary. Your day ends in Budapest, a bustling city on the romantic River Danube. Enjoy a scenic cruise on our private boat on the romantic Danube. You’ll savour a tasty dinner selection of Hungarian specialities with drinks included and see Budapest’s spectacular illuminations, which give it the nickname ‘The Paris of the East’. View the city’s sights with your Local Specialist including the Fisherman’s Bastion, Heroes’ Square, the Church of St. Matthias and panoramic views of the city from Gellert Hill. Afterwards explore on your own or maybe take a trip to Szentendre. Tonight dine at your hotel. Explore more of Hungary and follow our guide out of bustling Budapest to the picturesque medieval town of Szentendre, set on the banks of the Danube and awash with ancient walls, cobbled streets and beautiful vistas. Here we’ll enjoy a Goulash cooking demonstration before sampling this essential Hungarian dish during lunch, which also includes cake and drinks. Afterwards, perhaps strike a bargain in the shops that sell beautiful Hungarian embroidery, ceramics and paprika. Journey through the Transdanubia region to Győr. Founded by the Romans, Győr has retained much of its medieval and Baroque charm. Continue across the Austrian border and arrive later in Vienna, famed for its classical music. Consider joining an Optional Experience to a famous local hostelry for traditional Austrian cuisine and a musical performance. Take a guided tour of this magnificent Gothic Revival building, the most ornate state parliament in Europe. You’ll also have time to relax with a visit to the world famous Gundel restaurant for pancakes and drinks. When the Parliament is closed, we will visit the exquisite ‘Renaissance’ Opera House and the optional will be offered at €43. This morning consider a guided visit to Schönbrunn Palace, the former summer residence of the Habsburgs. Later this afternoon from the Parliament to the Opera, the Hofburg and City Hall, your Local Specialist shows you all the sights of this beautiful imperial city. A wonderful evening of all things Viennese! Enjoy a superb dinner with drinks, followed by a concert of Viennese classical music. Works by Johann Strauss and Wolfgang Amadeus Mozart will be performed and your ‘A Class’ tickets and a complimentary glass of sparkling wine or juice during the interval will only enhance the experience. Leave Vienna and cross the border into the Czech Republic. See the medieval town of Brno. Journey through beautiful Bohemian countryside to the golden city of Prague. Prague spans the River Vltava and ranks as one of the best-preserved cities in Europe. Your Local Specialist gives you an insight into the city’s history during your sightseeing tour, which features Prague Castle, the Cathedral of St. Vitus and the Old Town Square. In your free time, perhaps take a cruise on the Vltava River. Travel across the border into Germany, where you arrive at the quaint town of Rothenburg ob der Tauber. See the sights during your orientation of the city, including medieval streets and fortified walls. There’s time to shop for Christmas ornaments before returning to Frankfurt where you enjoy a dinner. Say goodbye to your Travel Director and travelling companions as your memorable holiday comes to an end. Frankfurt Airport transfers are available. Conditions apply.